As a little girl, I remember going to the old People’s drugstore near our house and my mom buying me a package of Sixlets. When Brian recently reminded me of them, I immediately snatched the chance to step away from licorice and focus for a bit on these yummy chocolate candies. Sixlets are similar to M&Ms, being small morsels of chocolate covered with a crunchy candy coating. However, there the similarities end. Instead of the flattened orb that M&Ms resemble, Sixlets are a round ball. In addition, the chocolate they contain is far superior to that which you find in M&Ms. In all honesty, I loathe M&Ms. Other than making me thirsty, they do nothing for me. Sixlets are quite different. Instead of having a uniform taste among all the colors, there are at least two different flavors. The orange color pieces are the most obviously flavored ones, and I think I can detect another flavor in the browns. Among the rest, however, it is almost impossible to discern any difference. But, that’s always been part of the fun for me – are they all different flavors, or just the oranges? If I eat all the yellows at one time, will I discover a unique flavor? Ok, so I may be a tad obsessed. Me, obsessed with candy? Never! I remember as a child how Sixlets came in a long tubular cellophane, similar to Smarties (US, not UK). It seems that now they have expanded their offerings, and larger packages are available. Nothing will ever beat popping them out of the end of the package one by one and savoring their smooth chocolate flavor combined with the sweet, vaguely fruity candy coating. Who Put The “Six” in Sixlets? I love Sixlets…I too noticed the fake orange flavor they had going on. A couple years ago, I began to muse over why Sixlets are called “Sixlets”. There aren’t six colors, or six flavors, six ingredients, or even six in a package. I began to e-mail companies that sold them, asking why they are called such. None of them knew why, and a few even said if I ever find out, to let them know! Does anyone know the story behind the name??? I remember going to the corner store as a kid and picking up the tiny sleeves for 5 cents a piece. If mom gave me a quarter that morning, hey! Five sleeves! And I agree with the reviewer. These, to me, are favored over M&Ms. I’m not sure if it’s the chocolate inside, or just the nuances of the candy shell, but they do taste different. I got some of these delicious morsels just the other night at the store, and sitting here eating them right now, I TOO can taste the difference between the colors. For me however, it is the orange and yellow ones that taste different. So, did anyone ever find out exactly why they are called sixlets? We handed them out for trick-or-treat this year and my curiosity got the better of me. I would appreciate if anyone knows. I may not be able to sleep tonight! Isn’t this great that all these people want to know the story behind the name sixlets? If nothing else whoever created it found a great marketing name, a name people remember, even ruminate about, seek out. Wow! And the media touts Coca Cola’s marketing genius. What candy company makes or made Sixlets? Usually the company has the story behind the name. I know a person who worked for Hershey Candy Company and was involved in developing the name and marketing for KitKat. Age? I also remember sixlets sold in the penny candy group at the candy store in my little community of Quiet Dell W. Va. So I think that sounds like sixlets may be older than m&m’s. Another question from a trivia buff. 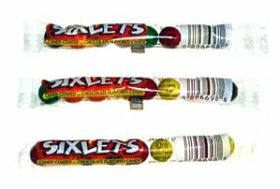 First of all, Let me say I used to love Sixlets. However, although I still like them, I would never choose them over any variety of M&M other than plain. These tasty little balls of off-colored goodness have changed as of late and are now covered in what tastes exactly like the popular vending candy Runts. The inside is still the same gritty, slightly malted milk ball flavored waxy “chocolate” everyone remembers, but the new fake fruit flavored candy coating has tainted these tiny gems in my opinion. Hope it’s just a phase. Anyone remember Delpha Rolls? Stale flat red licorice rolled up like caps for a cap gun? is the circumference of a sixlet the same in the small, clear tubular packages as it is in the large yellow boxes. I may be completely delusional, but it seems to me this is the case. 1. From Wikipedia: “Sixlets are a small, round candy-coated chocolate-flavored candy. The chocolate centers are made from a mixture of cocoa and carob, giving them a “malted” taste. They are usually sold in thin cellophane packages that hold them in a tube-like formation. The ball-shaped candies come in a number of colors, including red, brown, yellow, green, and orange. An Easter variation of the candy adds white, pink, and blue pieces while removing brown ones from the mix. A package of Sixlets will melt if kept in a pocket for extended periods of time. Some prefer a slightly melted sixlet. Different colors have a slightly different taste from one another, due to their candy coated shells. For example, the orange-colored ones taste like orange chocolate. On some variations of the Sixlets package there is a web address (www.sixlets.com). This address does not exist on the web. However, at one time, the site did redirect to SweetWorks’ webpage: http://www.sweetworks.net.” (That website gives no history of the candy at all). 3. From The Board (a website that answers any and all kinds of questions): “Sixlets got their name because they were originally sold six for a penny. They’re now up to $60 for a 24 pound case.” (Prices in 2002; oldtimecandy sells a box of 48 tubes with 20 pieces per tube for a mere $8.99 today). There were a few other small references, though nothing resulting in an “official” history of the naming of Sixlets. I’m betting it was (as I recall from my childhood of penny candy purchases, carefully orchestrated to get the most candy for my money – no different from my purchases today for the most part) due to the fact that yes, there were six candies in a small cellophane tube for a penny. What a deal; I remember them well! I never knew they made them with carob, but I always wondered why they didn’t taste like other chocolate candies. So there ya go, people, wonder no more! Sixlets were originally six in a pack. Simple, eh? Makes sense to me! So, there’s no real big mystery about the SIXLETS? Dang!!!!! that’s a bummer, I was really going to do some serious reseach on their origin. DANG!!!!!!!!!!!!!!!!!!!! The only answer I’ve come across as far as the name dilemma is concerned is that they originally came in six oz. packages. mmmm, I was so happy when I found a dollar store near my house that sold these things in boxes like Snowcaps (Another of my faves). Hundreds of sixlets for a buck! Yep, I bought scads of those little “six packs” @ $0.01 each! Didn’t know they mixed carob and chocolate but really liked them better than m&m’s (not that I would turn down the m&m’s! ).